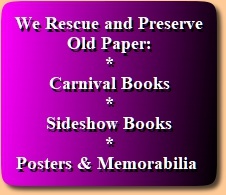 Here you will find the books from the House of Deception Carnival & Sideshow Library listed by category. Click here to see the books listed in a single Bibliography, A-Z. COPYRIGHT! YOU MAY NOT REPRINT THESE BIBLIOGRAPHIES! Please bookmark & link to HouseofDeception.com - New titles are added frequently.